Today’s dynamic, global business environment provides a variety of challenging and rewarding career opportunities for those who study marketing. Personal selling, marketing research, product management, international marketing, advertising and marketing management are among the many career options for marketing professionals. The marketing program provides students with the skills needed to seek employment in these fields. Students will learn the basic principles of marketing with an emphasis on the importance of coordinating all business functions, including product, price, promotion and distribution in order to meet customer’s needs. Students will then expand on this basic knowledge with courses in consumer behavior, marketing research, international marketing, marketing communications and personal selling. A course in marketing management, which incorporates material from the previous courses into a cohesive whole, concludes the program. The professors in the marketing department believe in the value of experiential learning. Many marketing courses require a final project that allows students to apply theoretical concepts learned throughout the semester to the business environment. Throughout their experiences in the marketing department, students are also provided with opportunities to learn and practice communication skills that will prove invaluable in the business environment. In addition, the Marketing Management capstone course allows students to work for actual clients from the business community. Projects require identifying the client’s marketing needs and providing solutions through written and verbal presentations. These experiences and skills can be added to students’ resumes to provide them with an advantage in a competitive job market. Basic principles of marketing. Emphasis is placed on consumer’s role in marketing and on marketing environment. The basic product, place, price, and promotion decisions are examined. Research methods and procedures in the marketing process; emphasis on the sources of market data sampling, preparation of questionnaires, collection and interpretation of data, and the relation of market research to the policies and functions of the business enterprise are studied. Study of the consumer decision process in the marketing context. Selected concepts from psychology, sociology, anthropology, and other behavioral disciplines are analyzed to develop the student’s ability to understand and predict reactions of consumers to marketing decisions. Focuses on the role of marketing in today’s global economy. Environmental differences among nations will be discussed and emphasis will be placed on the modifications of marketing thought and practices that these environmental differences require. While these important differences will be discussed, world markets where products are becoming standardized will also be emphasized. Topics include corporate organization for international marketing, the nature of marketing information and research in the international arena, and the challenges facing managers who must make international marketing decisions. Development of an understanding and appreciation of the personal selling process. Basic sales concepts, principles, and techniques are examined. Personal selling skills are enhanced through discussions, role playing, and sales presentations. In-depth examination of marketing communication tools as they relate to marketing management. Particular topics to be covered include attitude and persuasion strategies, advertising management, direct marketing, and sales promotion. Exposes students to the latest developments in the field of marketing. Emphasizes the role of a marketer as the organization’s decision maker. Provides the students with interaction with professional business leaders and experience with the application of marketing theory. This course is designed to address the challenges of marketing in a rapidly changing environment. Emphasis is placed on analyzing the internal and external marketing environments to extract useful information from raw marketing data. Students will learn to apply knowledge and concepts of marketing, such as product differentiation, market segmentation, and marketing research, in the development of a marketing plan. 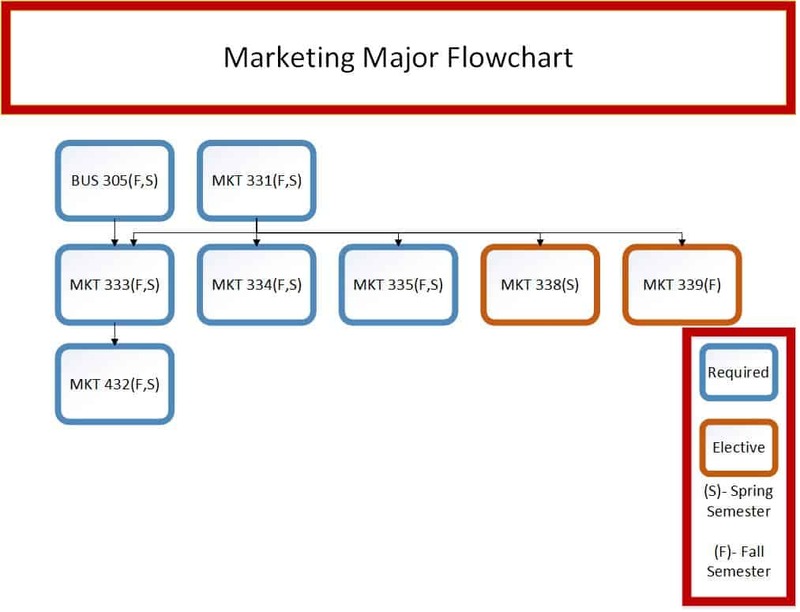 Through the use of case analysis and computer simulation, students experience firsthand the complexity of making detailed marketing decisions in a competitively dynamic environment. Students assume responsibility for making decisions regarding prices, distribution, sales force management, and marketing research allocations. Emphasis is placed on integrating marketing research, corporate resources, and industry characteristics to respond to today’s problems and to anticipate future problems and opportunities. Focus is on the global market. Open only to juniors or seniors with a grade point average of 3.0 or higher in their major courses. A maximum of three semester hours may be earned. All individual research projects are reviewed by three faculty members from two different disciplines.